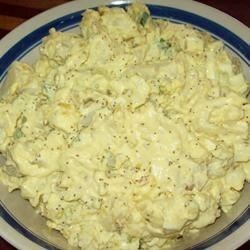 "A versatile potato salad with lots of flavor and a nice crunch"
Bring a pot of salted water to boil, place potatoes in water. Boil until potatoes are tender. Drain well. Let the potatoes cool 30 minutes. Peel the skin off of the potatoes and cube them. In a medium size mixing bowl combine potatoes, mayonnaise, ranch dressing, onion, celery, green pepper, salt and pepper. Cover and refrigerate until well chilled. I made this several times. It is easy to make and tastes fantastic! I added more amounts of everything (to make more) bacon bits, parsley and a table spoon of vinegar. GOOD FOOD NEVER TASTED SOOO GOOD!!! I made a bigger batch and did not use fat free(YUCK) but basic recipe is great! This was a really good recipe. Much easier than a recipe I have used in the past and Lots of compliments. My son liked it when bacon was crumbled over the top.